Why didn’t your hydrangeas bloom this year? Most likely they were either pruned at the wrong time of year or their flower buds were damaged by winter weather or foraging deer. This panicle hydrangea, recognized by it’s cone-shaped flower head, is in a Sharon, MA garden. still blooming in early October. Why didn’t your hydrangeas bloom this year? Most likely they were either pruned at the wrong time of year or their flower buds were damaged by winter weather or foraging deer. With so many species and numerous cultivars, hydrangeas confuse many gardeners and even landscape designers when it comes to understanding the best time of year for pruning. 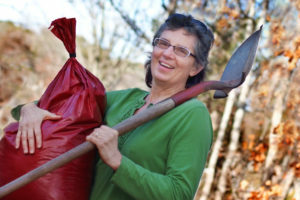 Many gardeners prune at exactly the wrong time, eliminating almost all flower buds for the entire season. Most early blooming shrubs, including some hydrangeas, develop their flower buds during the summer and fall of the previous year. This is known as blooming on old wood. Other hydrangeas develop their flower buds in the spring every year, then bloom later in the season. This is called blooming on new wood. Hydrangea cultivars such as Endless Summer™ bloom on both old and new wood. Panicle hydrangea (Hydrangea paniculata) and smooth hydrangea (Hydrangea arborescens) develop their flower buds on new stems (new wood). Therefore they can be pruned back severely in the late fall or early spring to manage their size, and they will still provide flowers. Even after exceptionally cold winters where stems are killed to the ground, new spring stems will produce flowers. In our climate and soils, panicle hydrangea and smooth hydrangea are typically the easiest species to grow and provide the best show. Panicle hydrangeas, for instance, can bloom from July through October. Common panicle hydrangea cultivars include: Limelight’, Vanilla Strawberry, Little Quick Fire, ‘Grandiflora’ aka PeeGee, ‘Fire and Ice’, Bobo®, ‘Bombshell’, ‘Little Lamb’, Quick Fire®, ‘Pee Wee’; Pinky Winky®, ‘Praecox’, and ‘Tardiva’. You can recognize them by their cone-shaped flower heads. Common smooth hydrangea cultivars include: ‘Annabelle’, Invincibelle Spirit®, Incrediball®, and ‘Grandiflora’. By contrast, hydrangeas that bloom in the spring bloom predominantly on old wood from flower buds that were formed during the previous summer and fall. They include bigleaf hydrangea (Hydrangea macrophylla), oakleaf hydrangea (Hydrangea quercifolia), mountain hydrangea (Hydrangea serrata) and climbing hydrangea (Hydrangea anomala subsp. petiolaris). These varieties should be pruned immediately after the flowers start to fade. You can cut off the just the flowers or cut the stem at any point you need to in order to control the size and shape of the shrub. If you prune later in the year, you’ll be removing next year’s flower buds. If you know the type of hydrangea you have in your garden, it can take some of the mystery out of understanding why they’re not blooming as you expected, and knowing when to prune them. If you do not know what type of hydrangea you have, do not prune them. Remove only the dead wood in spring, then wait until they bloom to determine when to prune them the following year. If they’re planted in a favorable position in your landscape, they’re well worth waiting for. 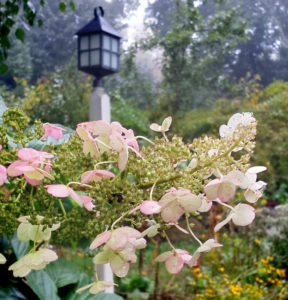 This entry was posted in Hydrangeas, Landscape, Pruning, Sharon MA, Shrubs and tagged anomala, arborescens, hydrangeas, MA, macrophylla, oakleaf, paniculata, pruning, serrata, Sharon on November 17, 2018 by admin.